Since our foundation in 1988 by staff with many years experience in the laboratory industry, Priorclave has grown to become one of the UK's premier manufacturers of Laboratory Autoclaves. Our present premises in South East London have been enlarged over the years to provide over 2,500 m2 of manufacturing space. Whether for use in research or general laboratory applications, the performance and build quality of the Priorclave QCS range of front loading autoclaves has made it a global success. Due to its popularity the company will be highlighting its smallest steam steriliser from the range at next month’s Medlab exhibition in Dubai – 5th to 8th February 2018. Visitors to stand Z1 - C58 will have the opportunity examine first-hand the superior build quality of the Priorclave QCS EH100, a 100 litre laboratory autoclaves. The versatile C60 top-loading laboratory autoclaves available from Priorclave are the ideal sterilisers for laboratories looking to process tall items such as fermentors and large capacity Erlenmeyer flasks or they have a high-density load requirement but have limited floor space. Designed and built by one of the UK’s leading autoclave manufacturers, the Priorclave compact C60 autoclave with its 60 litre stainless steel, top loading chamber can accommodate easily ten one-litre or sixteen 500ml bottles or six one-litre Erlenmeyer flasks. Now available on all new laboratory autoclaves and research grade sterilisers leaving the Priorclave production where a printer is required will benefit from inclusion of a new thermal printer. The larger sterilising chamber of Priorclave’s Q63, 320 litre front-loading autoclave and relatively small overall machine footprint has become a much sought-after specification for many universities. For laboratories with segregated loads waiting sterilisation each requiring their own unique process settings may cause serious delays and create unsafe bottlenecks within a laboratory or cleanroom if they only use a single autoclave. Such situations can be overcome with the new range of stackable autoclaves being introduced by British manufacturer Priorclave. It brings greater versatility to autoclave usage with the ability to sterilise two distinct loads simultaneous, each with their own sterilisation control setting. British autoclave manufacturer Priorclave is showcasing one its’ most versatile front loading autoclaves at the Medlab exhibition. For lab managers wanting an affordable, simple to operate and easy to install steam steriliser the self-contained Priorclave C40 benchtop laboratory autoclave is the perfect choice - a featured-packed, competitively priced compact autoclave offering truly exceptional value. There are a number of options developed by this British specialist in laboratory autoclave manufacturer including vacuum ideal for those research laboratories carrying out low-volume sterilisation of items such as bagged mixed plastic waste, tubing and narrow bore glassware as well as models ideal for those operating Cat3 labs. British laboratory autoclave manufacturer Priorclave has just released a new How to Build video which takes the viewer on a journey through some of the key production, assembly and test procedures required for building an autoclave. The QCS100 litre energy-efficient laboratory and research grade autoclave available from Priorclave will appeal to laboratory managers in diverse industrial sectors such as food, drink, dairy, pharmaceutical, agricultural, education, healthcare as well as numerous research and educational institutes within the public sector. This model is just one of three sizes is the QCS range each featuring a large, spacious 500mm diameter chamber, which is believed to be largest currently available for this size of autoclave. These were designed for laboratories looking specifically for an autoclave with a high loading capacity but limited on available lab floor space. The Medica exhibition in Dusseldorf is a popular event on the exhibition calendar for British autoclave manufacturer Priorclave. The Autoclave Knowledge Bank Check Book is an impartial guide, giving an insight into some of the key factors that could help in making the best possible choice of style and design before placing that all important laboratory autoclave order. Introduction by Priorclave of a laboratory autoclave with a 400 litre sterilising chamber will be good news for organisations looking to purchase an affordable, energy conscious and versatile steam steriliser. Laboratories looking to effectively sterilise taller items but with limited floor space will welcome the introduction of the new C85, top-loading autoclave from Priorclave. The latest addition to Priorclave’s comprehensive range of research and laboratory autoclaves is the C85 top loading steam steriliser. Earlier this year specialist autoclave manufacturer Priorclave agreed to abide by the hourly wage rate set by the London Living Wage. With its 350 litre chamber the RSC 350 laboratory autoclave is the perfect choice for high throughput sterilising applications or where there is a requirement to handle extra-bulky items. British specialist laboratory autoclave manufacturer Priorclave has been awarded an export contract to deliver a number of its QCS150 front loading autoclaves to medical centres throughout Northeast Africa. With the launch of the Priorclave Q63 front-loading cylindrical chamber autoclave range it provided the laboratory manager with a truly viable alternative to large, more costly rectangular chamber autoclaves, yet capable of delivering the same sterilising throughput. The complete range of Priorclave benchtop laboratory autoclaves are now available with short stand-off legs to provide easy access beneath the steam steriliser for much easier cleaning and disinfection of laboratory work surfaces. Christine Wade has recently joined the Priorclave Customer Care Team with special responsibility for co-ordinating every aspect of service support for its range of laboratory and research grade autoclaves. The Priorclave Q63, 320 litre front loading capacity autoclave has given laboratories a real opportunity to consider this more economically priced cylindrical chamber design rather than investing in a large rectangular chamber steam steriliser. Users of the Q63 autoclave may also benefit from lower overall running costs associated with reduced power and water usage. Since chamber size has a major influence on autoclave selection, Priorclave designed the cylindrical chamber of the Q63 with a taller profile than that found in most ‘cylindrical’ machines, giving these autoclaves an impressive load capacity ideally suited to sterilising larger bulky items as well as enabling small and taller items could be sterilised in a single process. The Priorclave QCS 100 laboratory autoclave is the perfect choice for any lab manager or technician looking for a more compact, economically priced 100 litre capacity autoclave. British autoclave manufacturer Priorclave has developed a 100 litre capacity front loading autoclave with the largest cylindrical chamber diameter for this capacity steam steriliser. Continuing expansion as a global laboratory autoclaves supplier has resulted in British autoclave manufacturer Priorclave making two new appointments to its Customer Care team. The Autoclave Knowledge Bank Check Book is an impartial guide and insight into some of the key factors that could help you make the right decision before making that all important laboratory autoclave purchase. When specifying or purchasing any expensive and complicated piece of equipment it is essential to be able to ask the right questions in order to get the right answers and make an informed decision - a few minutes at the Autoclave Knowledge Bank could save your company time and money. British laboratory autoclave manufacturer Priorclave will reveal the quality of its autoclave build through the QCS EH100 steam steriliser that will take centre stage on stand EO2 in Hall 1 at the forthcoming Medica exhibition. Introduction of a 60 litre benchtop steriliser by specialist laboratory autoclave manufacturer Priorclave gives laboratories with restricted floor space the opportunity to buy into a slightly larger benchtop autoclave offering a level of performance settings and operating flexibility usually reserved for larger floor-standing autoclaves. The featured packed H60 autoclaves, the latest benchtop models from Priorclave and available in both standard and vacuum models, are ideal for a wide range of sterilising applications such as media preparation, laboratory waste, liquids and diluents, glassware, instruments and apparatus. Specialist laboratory autoclave manufacturer Priorclave is extending its range of high capacity rectangular chamber sterilisers with the launch of a new 850 litre model. 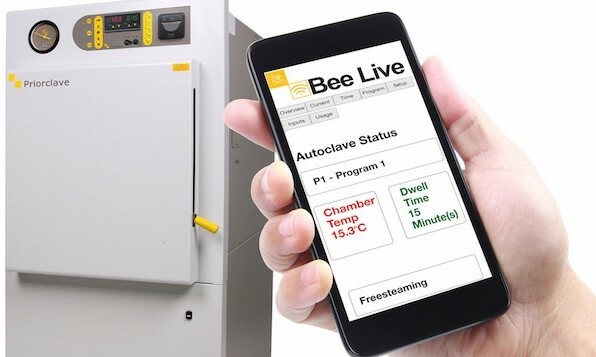 In addition to a number of laboratory autoclaves on show by Priorclave on stand D37 - Hall 4.2 at the forthcoming Achema exhibition the company is expected to announce the launch of a new step-by-step guide to choosing the next autoclave purchase. The combination of secure key-lock and one-touch pushbutton controls make the Priorclave QCS H150 (150 litre chamber autoclave) range of front-loading autoclaves one of the safest and easiest to use laboratory autoclaves that are ideal for a busy research or clinical laboratory. Another key benefit of this QCS H150 front-loading steriliser design is easy access to the 500mm diameter stainless steel chamber via the wide door opening that allows easy loading of even heavy loads delivered direct by trolley. Another benefit is that small and tall items can be sterilised side-by-side in a single process. This month Priorclave strengthens its sales teams with the appointment of Adam Rutter as Export Sales Manager. Everything about Priorclave C40 benchtop laboratory autoclaves is designed to appeal to those wanting a simple to operate and easy to install steam steriliser. It is virtually self-contained, out of the box the C40 benchtop autoclave requires simply plugging into a 230V supply. And every sterilising process is easily programmed through the proven TACTROL®2 microprocessor controller - just set temperature and time, select any options needed and press start, operation is fully automatic once the cycle has started. For laboratory managers undecided on the best autoclave for their next purchase a new 16 page brochure just released by Priorclave is a must read. The QCS 150 Pass-Through autoclave is the latest and smallest double-door autoclave to be introduced by Priorclave and is purpose designed to enable laboratories maintain a secure sterile path for media and waste as it passes in and out of a sealed laboratory. The Priorclave H60 compact autoclave, designed specifically to meet a customer requirement for a steam steriliser with all the proven strengths and features of the current Priorclave Compact range but with a 50% increase in chamber capacity, is now part of the Companies standard range of benchtop autoclaves. The compact top-loading QCS EV150 autoclave has been developed by Priorclave specifically to give laboratories with limited floor space the opportunity to acquire a versatile autoclave that affords easy loading and programming. In addition to a standard format Priorclave is able to supply this autoclave in a vacuum. Designed with a 150 litre chamber and depth of 720mm, the QCS EV150 offers the real practical benefits of being able to sterilise both short and tall items side by side in a single process to help labs increase sterilisation throughout. The QCS EV150 was designed and is manufactured by Priorclave at its British manufacturing centre. To satisfy the requirements of laboratories wishing to carry out low-volume sterilisation of items such as bagged mixed plastic waste, tubing and narrow bore glass ware Priorclave has introduced the versatile MVA C40 benchtop vacuum autoclave. This week an insight into the design strengths and manufacturing skills of British laboratory autoclave producer Priorclave are revealed in a new Corporate Video. For laboratories limited on floor space but needing to sterilise tall items such as fermentors and large capacity Erlenmeyer flasks, or have a high-density load requirement, the latest version of the Priorclave C60 top loading autoclave could prove to be the perfect choice. This month laboratory autoclave manufacturer Priorclave announces the availability of a very much extended range of autoclave consumables. The RSC 350 laboratory autoclave from specialist autoclave manufacturer Priorclave is proving to be the ideal choice for those laboratories in the food and drink, dairy, pharmaceutical, agriculture, education, healthcare and research sectors looking to achieve high-throughput sterilising procedures or have a requirement to process large bulky items. The QCS front loading autoclave range introduced by Priorclave should help any laboratory increase its sterilising throughput owing to the combination of improved load capacity and exceptional operating performance. There may also be an added benefit of lower overall running costs associated with reduced power and water usage. This month, Priorclave’s new web site went live and reflects the company’s up-front policy of providing would-be autoclave purchasers with facts and figures that will steer them easily to identify the best possible steam steriliser for their application. First autoclave built by UK Company Priorclave for the American market following announcement that it has approval to manufacture to ASME standards was actually a bespoke designed, double stacked steam steriliser. For laboratories wishing to acquire a high capacity, front loading cylindrical chamber autoclave with an exception pack density at a more affordable price the ideal solution is a new 500 litre steam steriliser being launched by Priorclave. Priorclave Launch Autoclave Performance Analyser Jul 20, 2012 An advanced process review system - TACTROL ZERO - being rolled out across the entire range of autoclaves manufactured by Priorclave, adds further to the already excellent customer support provided by the company's Service and Technical Support team. Priorclave at ArabLab 2011 Jan 5, 2011 On Stand No. 340 at ArabLab Exhibition, Priorclave Ltd., will be exhibiting examples from their comprehensive range of Laboratory Autoclaves. They will include three of their most popular, electrically heated models. Priorclave exhibit at Arab Health Dec 14, 2010 On Stand No. RB39, first-time participant at the Arab Health Exhibition, Priorclave Ltd., will be exhibiting examples from their comprehensive range of Laboratory Autoclaves. They will include three of their most popular, electrically heated models. PRIORCLAVE renew their partnership with BioCote Mar 31, 2010 Priorclave Ltd. and BioCote Ltd have had a long-standing, exclusive agreement to incorporate the revolutionary BioCote® powder coating technology into the manufacture of their entire range of laboratory autoclaves. As a result, such has been the success of the combined technologies, they have renewed their partnership for a further two years. Autoclave manufacturer, Priorclave, combat surface microbial growth. Mar 22, 2010 In the fight against surface microbial growth, Priorclave remain the leading autoclave manufacturer whose entire range of autoclaves helps the hospital, biochemical, food and pharmaceutical laboratory environments to reduce their risk of cross contamination.